Dr. Pitt is a board certified, fellowship trained endocrine surgeon. She specializes in treating benign and malignant diseases of the thyroid, parathyroids and adrenal glands. 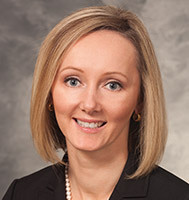 She employs multiple operative techniques, including minimally-invasive parathyroidectomy, laparoscopic and retroperitoneoscopic adrenalectomy, and intraoperative parathyroid hormone testing. She is particularly interested in patients with indeterminate thyroid nodules, thyroid cancer and adrenal lesions (incidentalomas, functioning tumors, and adrenocortical cancer). She is a member of the American Association of Endocrine Surgeons, American College of Surgeons and the Association of Academic Surgery. Dr. Pitt's research is health services- and surgical outcomes-based. She has a special interest in the doctor-patient relationship involving surgical decision making - also called shared decision making - and ensuring that patients understand their disease, treatment, outcomes and expectations.